A construction project undertaken by Casali Group, Inc. on behalf of Harvard University required air quality and dust analysis on a rush basis. 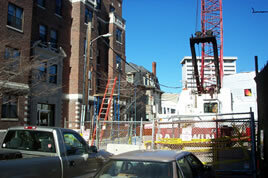 Tech Environmental performed air quality sampling on Prospect Street in Cambridge, Massachusetts during construction operations to determine the effects of construction equipment including a diesel-powered crane stationed immediately outside a residential window. Measurements of fine particulate matter (PM10), an indicator of diesel pollution, were collected. Samples were taken on top of portable scaffolding, erected to analyze the effects of current crane operations on a second floor residence. The residence was approximately 25 feet to the west of the operating crane and on the second floor of the building. The results showed that air quality at the residence were safely in compliance with the Massachusetts and National Ambient Air Quality Standards (NAAQS) during crane operations. A construction project for Harvard University presented potential air quality and dust concerns to a Cambridge neighborhood. Tech provided sampling and analysis on a rush basis, and demonstrated that air quality was in compliance with Massachusetts and national standards.